This five-part marble construction gives literal form to the spiritual ideal of balance suggested by its title. In the Indian Samkhya school of philosophy, the world and human experience comprise three qualities or gunas: tamas (inertia, darkness, sloth), rajas(dynamism, passion, pain), and sattva (poise, illumination, joy). Enlightenment is attained by holding these qualities in equilibrium, a state signaled by the color white. Born in Los Angeles, Noguchi spent his childhood in Japan but made his career in Paris, serving as an apprentice to Brancusi, frequenting the Surrealists, and forging his own path as both a sculptor and a designer. A fascination with Eastern philosophies informed many of his works, like this one, whose spare, abstract forms invite contemplative—even meditative—viewing. 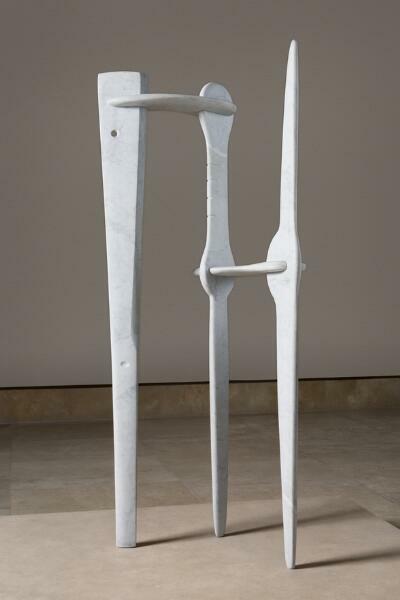 In 1945, after a brief excursion into figurative sculpture, Isamu Noguchi returned to pure abstraction and the beautifully polished form he had learned in Paris from Constantin Brancusi. The following year, he created The White Gunas, a slender ensemble of three vertical forms. The son of a Japanese father and an American mother, Noguchi bridged Eastern and Western thinking. This sculpture depicts the three gunas, or strands, of the Samkhya philosophy of India: tamas, which means darkness or stillness; rajas, denoting desire or passion; and sattva, which implies luminous goodness and clear thinking. According to Samkhya, the entire universe springs from the interaction of these three qualities. In alchemy, an ancient form of Western chemistry, the qualities of mercury, sulphur and salt act on the “prima materia,” or quintessence of things. Black, red and white are associated with the qualities in both esoteric systems, and both strive for a similar goal—to create a state of perfect harmony, where all elements turn luminously white, and enlightenment is attained.